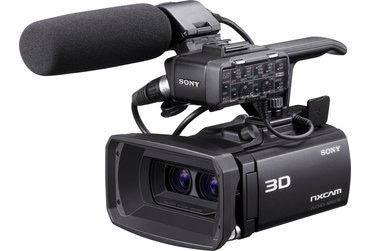 The HXR-NX3D1U is a compact, lightweight, WorldCam 3D/ 2D NXCAM camcorder suitable for principal photography in small budget productions or as a B camera in big budget productions. Thanks to its small size, low weight, simple operation and exceptional flexibility it can shoot 3D at camera angles that were never possible before. 3.5-inch Xtra Fine LCD display (1229K) providing user-selectable 2D or glassless 3D viewing. In addition, a separate display mode for left or right images, and an L/R composite mix of left and right images are available for easier confirmation of display. User-selectable HDMI output format - Output from the HXR-NX3D1U's HDMI jack to a 3D TV is selectable between Frame Packing with Full HD output of alternate left and right images, and Side by Side with output of horizontally compressed left and right images packed into a single frame. Large capacity, 96GB of internal memory enabling extended recording in 3D mode for approximately 7.5 hours. In addition, one Memory card slot accepts either Memory Stick or SD Cards. Dual Sony G Lens System provides exceptional image fidelity (aspherical + extra low dispersion glass) and real 6-blade iris for beautiful Bokeh. Short Minimum Object distance - 3D: Less than 3 feet (80cm), 2D: 0.4 inches (1cm). Dual Exmor R Sensor - 1/4 type with ClearVid pixel array provides 4.2 Million pixels, high image fidelity, excellent low light / low noise performance, and up to 240 fps in Smooth Slow Recording mode. The supplied Content Management Utility 2.1 software enables conversion of MVC video files to 2D AVC files with independent left and right channels. Imaging Device Two (2) 1/4-inch (4.5mm) Back-illuminated "Exmor R CMOS Sensor"
LCD Screen 3.5-inch Xtra Fine LCD display (1229K) providing user-selectable 2D or glassless 3D viewing. Pickup Device Two (2 for 3D) 1/4-inch (4.5mm) Back-illuminated "Exmor R CMOS Sensor"
Analog Audio/Video Output(s) Audio: Headphone Jack plus L/R audio with Composite Video; Component Video Out; S Video cables.